This thread will showcase why it is illegal to advertise IS on NC. I'll answer any questions you may have; but no further explanation than this post should be needed. Anyone else who advertises for this scum will be banned from NavalClash. Thanks. After running out of funds, sidewalk posts on mc-market looking for someone to host his harry potter server and help him revive it. After months of carefully recreating nbz from bits and pieces of code found online (which has been since taken down), Sidewalk posted to mc-market looking for a host for a harry potter server. This is the day he got an answer from someone named Droopystarfish. With the update coming out, I’d like to make it absolutely clear that there has always been a rule against toxic behaviour. People don’t get away with on other servers a quarter of what you children get away with on navalclash. So let’s set some ground rules, or rather, reiterate the rules that are and always have been in place. In navalclash, as in all aspects of life, be FRIENDLY and REASONABLE. To players and staff. We work for the server and the community, not ourselves. Don’t excessively swear. It’s childish and annoying. Help new players. Don’t harass players or staff. Follow the simple rules laid out for you. Own up to your mistakes. Take initiative. Be articulate! The update will be released very soon. Droopy, iiz, and myself have all agreed that the endless toxicity needs to stop. Hey all! Some of you might know already that we have a new sort of gamemode/event - DvZ! We will host it at random times, when lots of players are on, but if you get ten people to join it will start a game automatically for you. 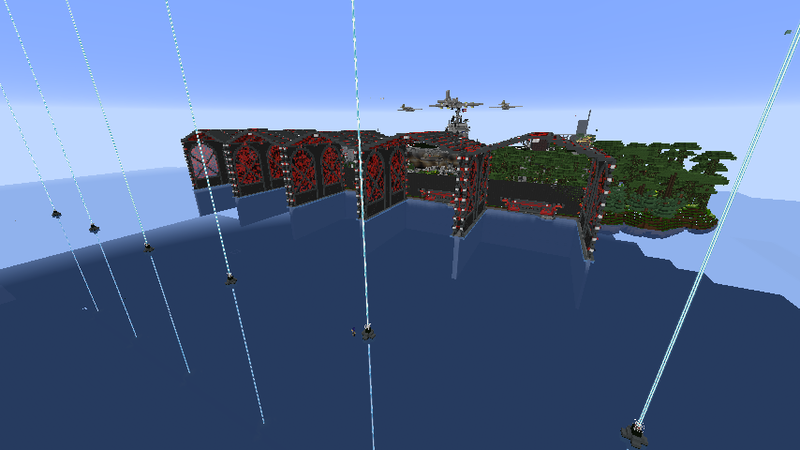 To join DvZ, simply type /server DvZ and you will be teleported there. *If you join from NavalClash and not the hub, you will still have the resource pack. All you need to do is relog and join from the hub* ---> We are working on a fix for this. Below, in as much detail as possible, is a guide on everything you will need to know to start out in DvZ. When you first join DvZ, you will be in a lobby like this. The game will automatically start when 10 people are online or a staffmember starts it. Hey all! Today, NavalClash proudly presents the Creative Server. Worried about crashing the server with worldedit? Don't! A special version of worldedit is installed that prevents all worldedit lag. Users can claim their free plot with /plot auto. For more plot commands, including information on downloading your plot as a schematic file, type /plot help. This patch includes some minor bugfixes/balance changes. -Infamous "Cannon Spam" bug = fixed. -Cannons can no longer fire whilst inside a _safedock region. -Ship freezing patch still sailin' strong, whooo! Would you support the addition of a loading time for cannons, in order to extend naval encounters? And if so, should they stack depending on the amount of cannon barrels you have? For example: 4s for single cannons, 6s for double cannons, 8s for triple cannons, or something of that sort. Vote in the poll above! -New, fancier safedock buoy system. -NC logo block de-squashified and repretty-inized by iiz. -NC logo block moved to chiseled stone brick. Moved back to Factions plugin. Moved back to the Player Factions system. -Robo's monument and Dave Mountain were made advertiser friendly. - Have two normal accounts.